I was just so moved by this article in the NY Times Sunday Styles section last week, “In a Charmed Life, a Road Less Traveled” by Layng Martine Jr. that I insisted my husband read it. 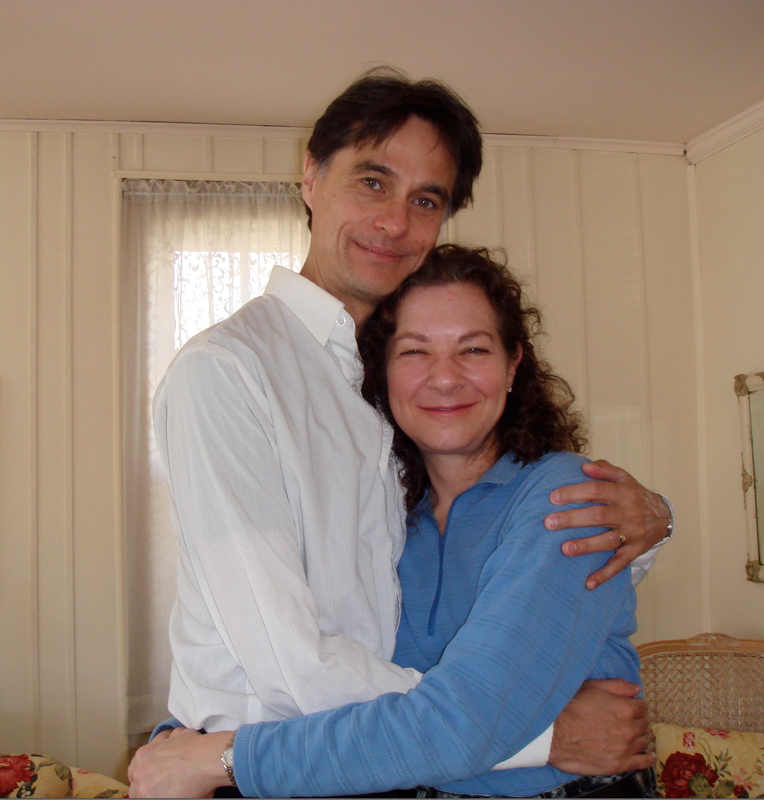 “Anyone who is in love is living a charmed life,” said the author, “especially if you’ve been in love for many years, through good times and bad.” I was moved both because it resonated with how I feel about my partner and because love never left this relationship. Not after the author’s wife lost the use of her legs, as well as other bodily functions. Not after she had to give up so many things she once enjoyed, and they once did together, like hiking in the mountains, strolling on a beach, tending to their garden. Martine Jr. continued, “After the doctor left, tears filled her eyes. “It was all too perfect,” she said, “wasn’t it?” And it did seem that way. It always had… Not long after getting home from the hospital, when we were having dinner by candlelight at our kitchen table, she burst into tears. “I don’t know if I can do this for the rest of my life,” she said. And then they began to look for what could be instead of what they had lost. “We began to think of what we could do to replace playing tennis, walking on the beach, working in the garden. Fifteen years after the accident they have found a way to still roll through Tuscany, in and out of Ireland’s pubs, and watch the sun set holding hands on a country porch. This is a story of love and support, of possibility and survivorship, of finding happiness in simple things and adapting to what life hands you. And while it’s easy to say when you’re feeling down look around at the people who have it worse than you, it can still be hard to make your unhappiness smaller. But the game really is to find ways to still have happiness and contentment no matter what life has handed you. And the lesson to be learned is it is possible. 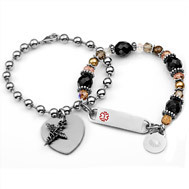 Do you wear a medic alert bracelet? DiabetesHealth ran an article on its web site last week which got to me, “Medical ID Bracelets: The $15 Lifesavers.” Admittedly, I’ve had diabetes for 37 years, been on insulin for 32 (I was misdiagnosed early and put on oral meds the first 5 years) and have never worn a medical alert bracelet. Why? Thirty years ago when I looked at them, there were few available, they were all ugly and screamed, “I’m deathly ill.” Or so they made me feel. Then I just sort of forgot about them over the years. I learned how to recognize and treat a low, never expect to have a time I can’t, and never received any suggestion from either my general practitioner or endocrinologist that it might be a good idea to wear a medic alert bracelet. When I think about that now, that seems a stunning lack of care. But reading the article about how such a bracelet can and does save lives, I thought how foolish am I not to wear one. I have enough lows and am alone often enough that I could end up in a situation where I pass out and such a bracelet could save my life. Each morning I walk an hour around my local park. I take my SweeTarts, some money and my keys, but nothing that would alert anyone to the fact that I have diabetes. I do carry a wallet card, but often am out and about without my wallet. Thinking back, my last two great lows both occurred in airports when I was traveling by myself. Luckily I had sugar with me and enough brain cells working to stop and treat myself, but what if I did not….? So, over the past week I’ve conducted an exhaustive online search to see what’s available, and being the finicky Virgo that I am, have only had trouble choosing because quite a few different styles appeal to me. Although I know I’m in for a bracelet; necklaces bother me and something on your knapsack or some other hidden place defeats the purpose. Also, it’s a bit tricky to find one that both is immediately identifiable as a medic alert bracelet and yet looks attractive enough that you’d wear it. But, too fashionable, and I doubt any paramedic would bother looking to see if there’s life-saving information on your dangly, jewel-crusted bracelet. But feeling these two bracelets satisfy that debate, right now I’m wavering between the beaded bracelet and more sleek stainless steel lynx bracelet, and then my friend who makes jewelry said, “If you buy an engraved plaque, maybe I can make a fashionable bracelet for it.” Well, now I’m just stumped altogether. But, it’s my plan to have one within a month’s time. I also checked my local drugstores and found you can buy a medic alert bracelet there for about $7.00 but don’t expect any style. If, like me, you haven’t thought about getting a medic alert piece of jewelry for decades or no one’s ever suggested you wear one, think again. And if you have access to the internet, expect to find enough choices, whether bracelet, necklace, charms etc, to spend a few hours finding just what you like. Well, that’s if you’re like me, I guess. It will be interesting to see how I actually feel wearing it after being unencumbered all these years. Will it feel like I’m shackled or a “Badge of Honor.” I’m going for the latter. Will let you know. Got an idea for an innovative new diabetes device or web application up your sleeve? Amy Tenderich, noted blogger of DiabetesMine, is running the DiabetesMine Design Challengewith a Grand Prize of $10,000 for ANYONE with a good idea to help manage diabetes: patients, parents, startup companies, design & medical students, developers, engineers, etc. The challenge is sponsored by theCalifornia HealthCare Foundation. The contest runs through May 1st and winners will be announced May 18th. in addition to the Grand Prize are smaller cash prizes, consults with design experts and a mini-workshop with health and wellness experts at Ideo, the global design firm. Check for submission and judging criteria and contest details and then let your innovation flow.